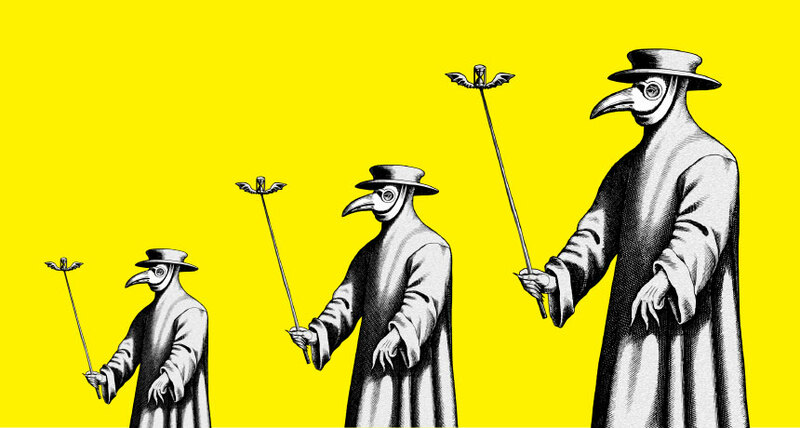 WE'VE COME A LONG WAY During the Black Death in the 14th century, plague doctors wore this now-iconic outfit as they attempted to treat patients. Sawbones illuminates what doctors thought they were accomplishing. Humans took a long, weird road to modern medicine. We don't have everything figured out yet, but at least we've learned not to drink the feces of cholera victims and never to plug dental cavities with a lizard's liver - unlike some of our ancestors. Gruesome methods like these are the heart of The Sawbones Book, a fleshing out of five years of the Sawbones podcast. The podcast features Sydnee McElroy, a family physician, diving deep into the history of bizarre and usually ineffective treatments for a wide range of ailments. She's joined by her husband, Justin, a veteran podcaster and writer, who plays a witty but less academically inclined foil. The book boasts impressive variety, including histories of treatments for the plague (strapping a live chicken to swollen lymph nodes), eating medicinal mummies (no, not gummies - mummies) and self-experimentation (do not try that at home). The authors keep up the podcast's back-and-forth dynamic, with Justin cracking jokes in sidebars amid Sydnee's lighthearted but (sometimes nauseatingly) detailed explorations. Teylor Smirl's illustrations, ranging from whimsical comics to vivid depictions of an anti-seasickness boat, bring to life the most macabre topics. Some of the most visceral moments are concentrated in a chapter on cholera. Justin warns that "things are about to get so, so bad," and they do. Sydnee does not flinch when describing the work of Max Joseph von Pettenkofer, a 19th century hygienist who was so (wrongly) convinced that cholera could not spread to people who practiced good hygiene that he drank diarrhea from a patient who had died of the disease. Naturally, he got cholera - but he survived and proclaimed his experiment a success. In recent years, the McElroys have taken on more contemporary subjects, addressing homeopathy, the anti-vaccination movement and conspiracy theories about fluoride in drinking water. Science News spoke with Justin and Sydnee about their new book, their show and their efforts to inspire more trust in science and, in particular, medicine. The discussion that follows has been edited for length and clarity. Justin: We wanted to do something that was about medicine because Sydnee's a doctor, but we didn't want get into giving medical advice. And Sydnee's always had sort of a passion for medical history. She's got a bunch of old medical devices, including a WWI-era stethoscope and a trephine [a metal tool used to drill holes in skulls]. It's a passion of hers.